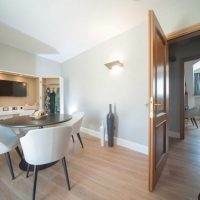 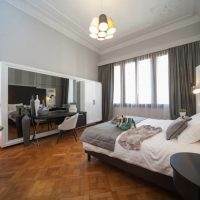 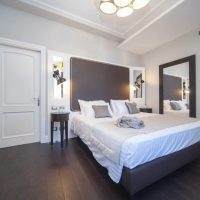 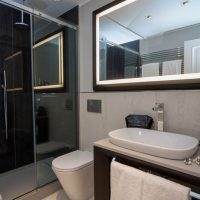 The charming atmosphere you can feel in these spacious, elegant and historical setting has been made even more unique by the recent complete renovation that exalted the new classic style. 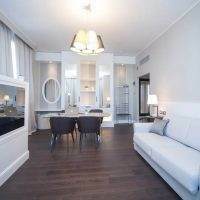 The neo-classical furnishing, the precious reflections, the warm materials and the refined lighting will make you immediately feel in a welcoming and exclusive place. 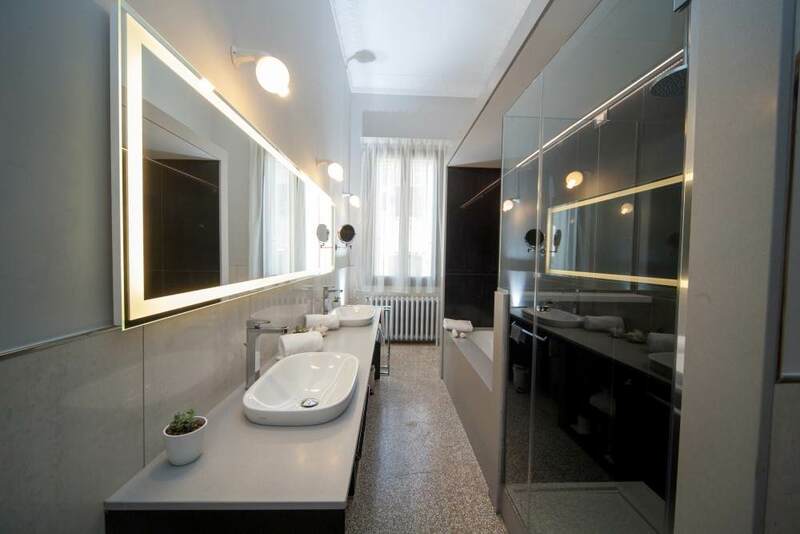 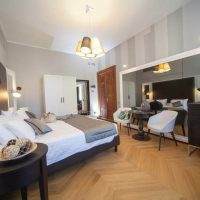 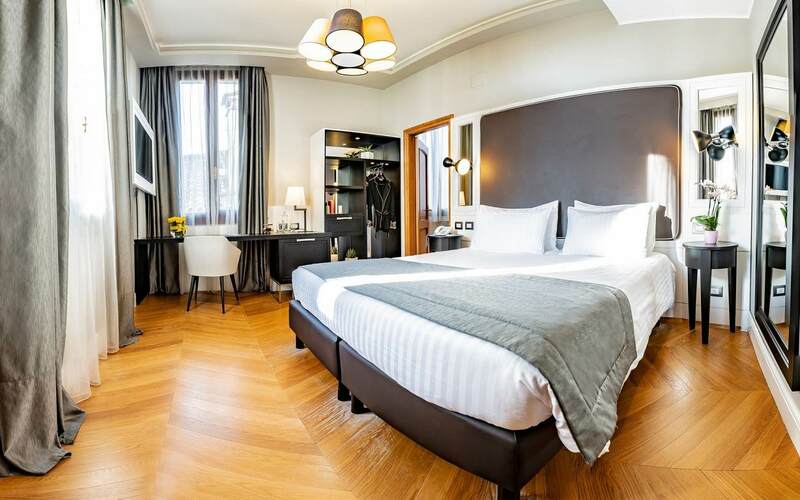 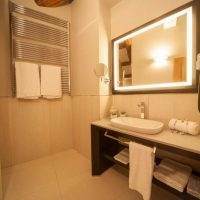 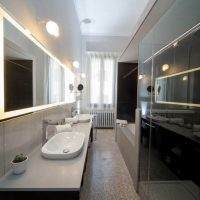 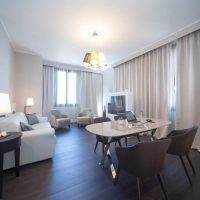 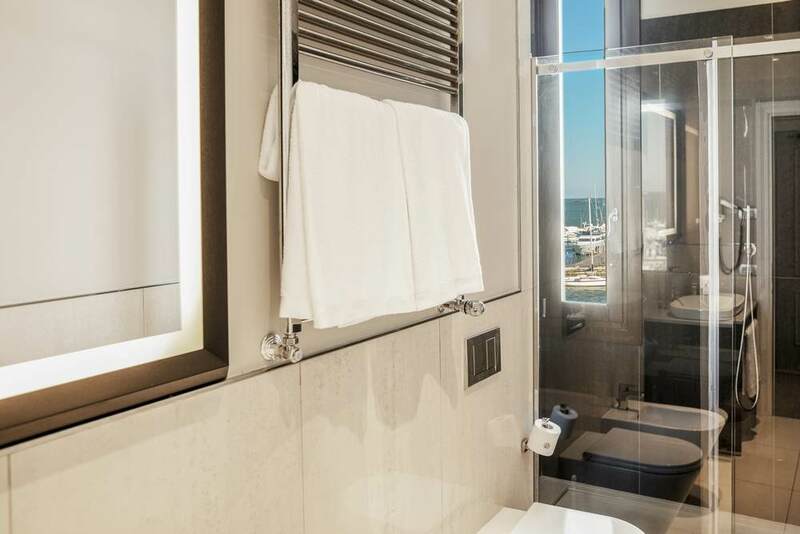 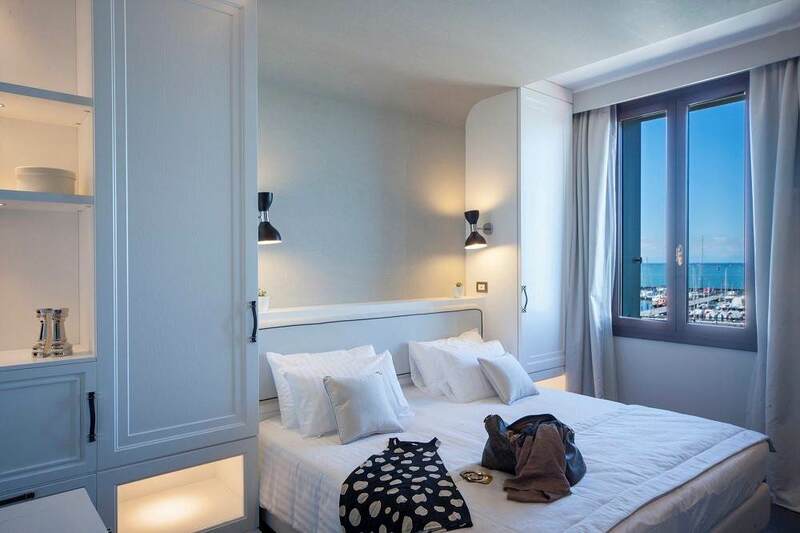 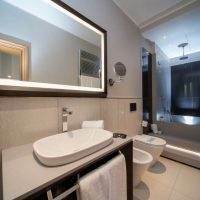 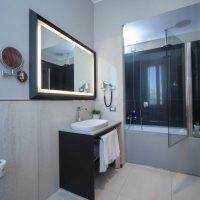 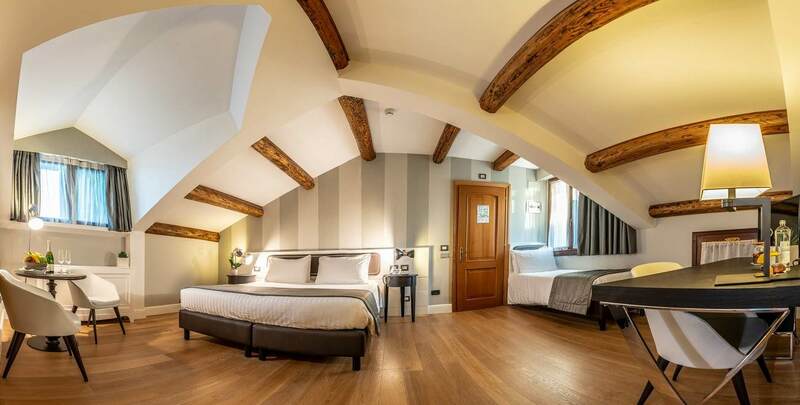 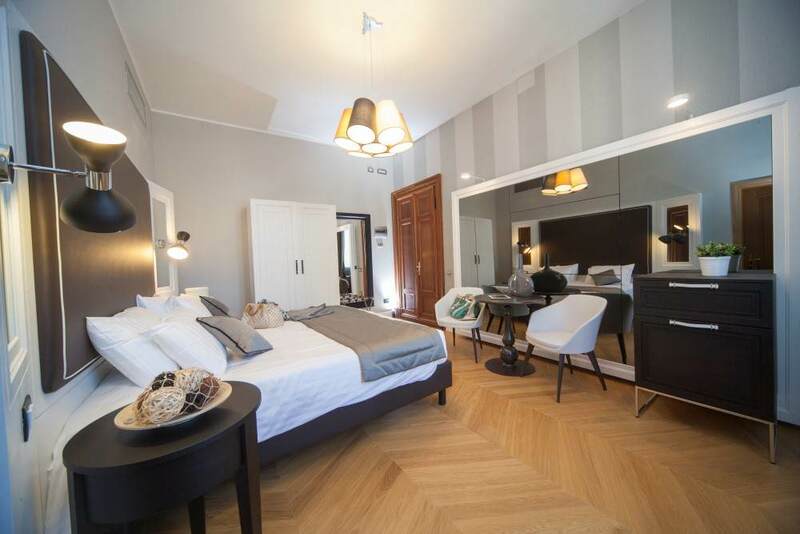 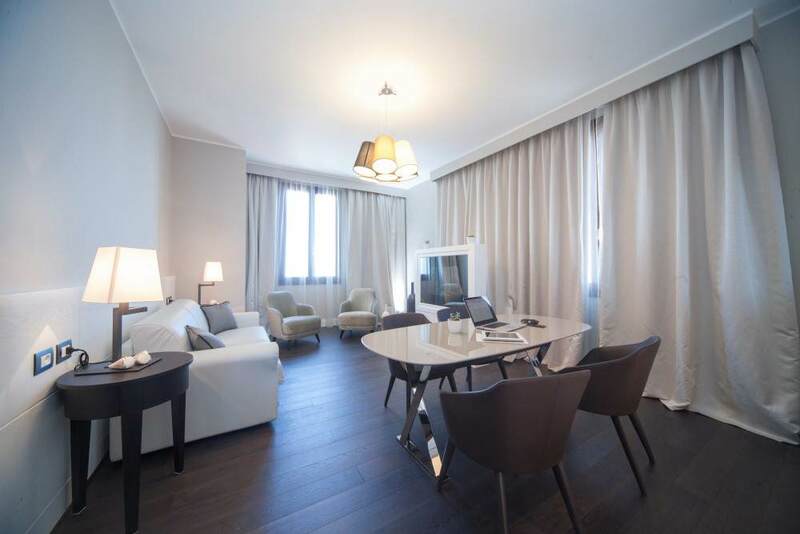 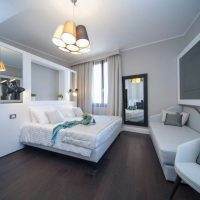 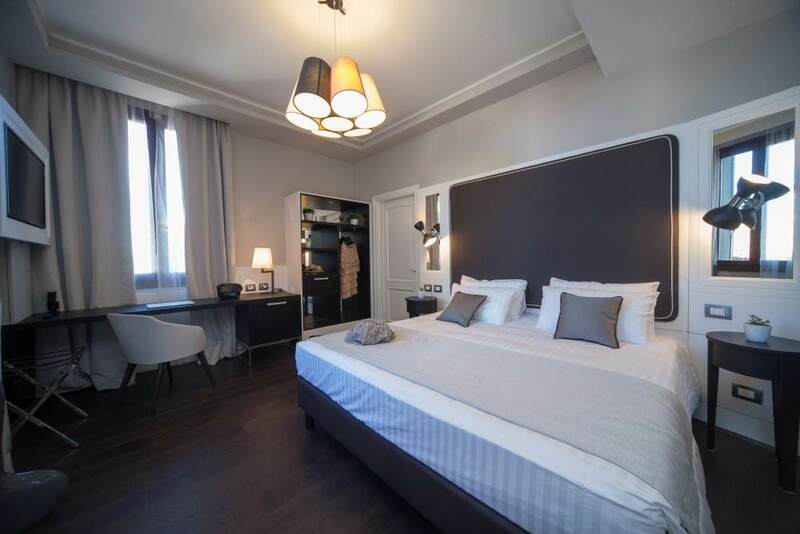 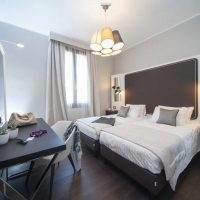 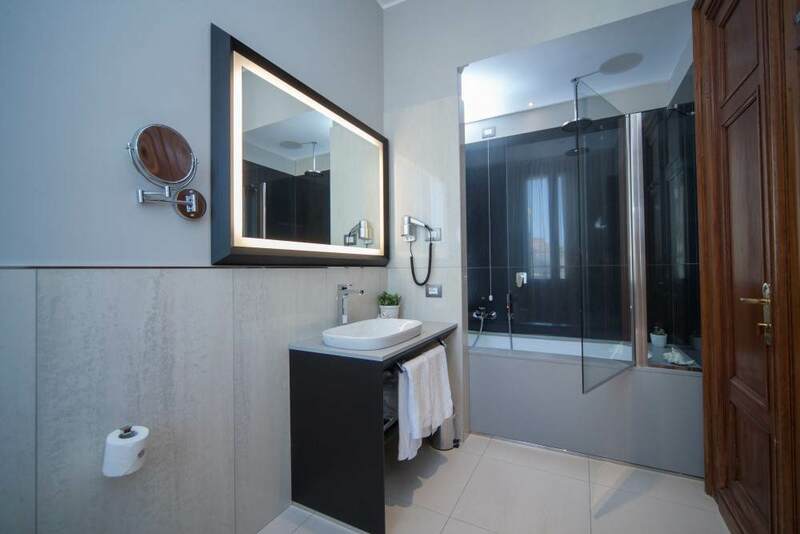 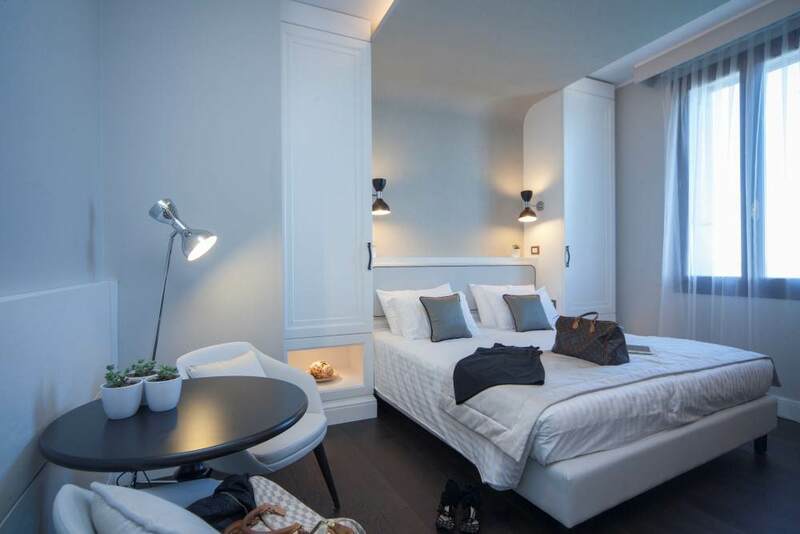 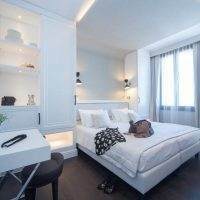 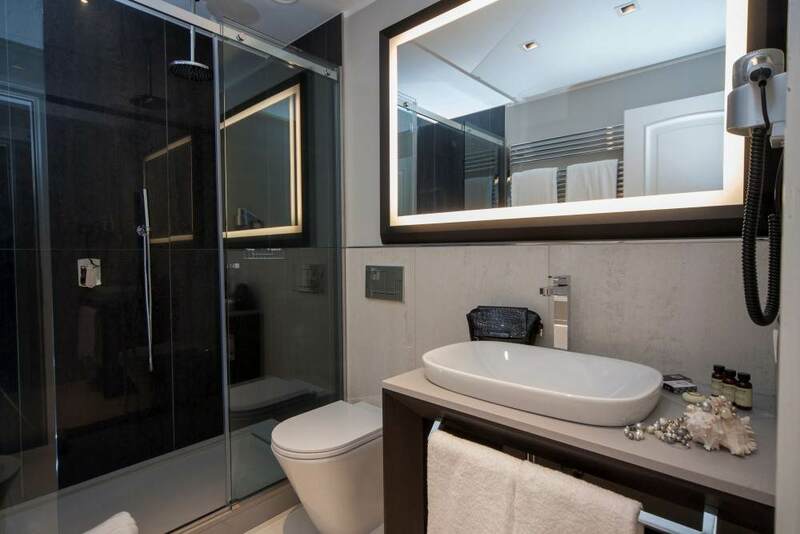 To make your stay even more special, Hotel Grande Italia offers a variety of rooms overlooking the venetian lagoon, Piazzetta Vigo or the characteristic little streets called “calle”. 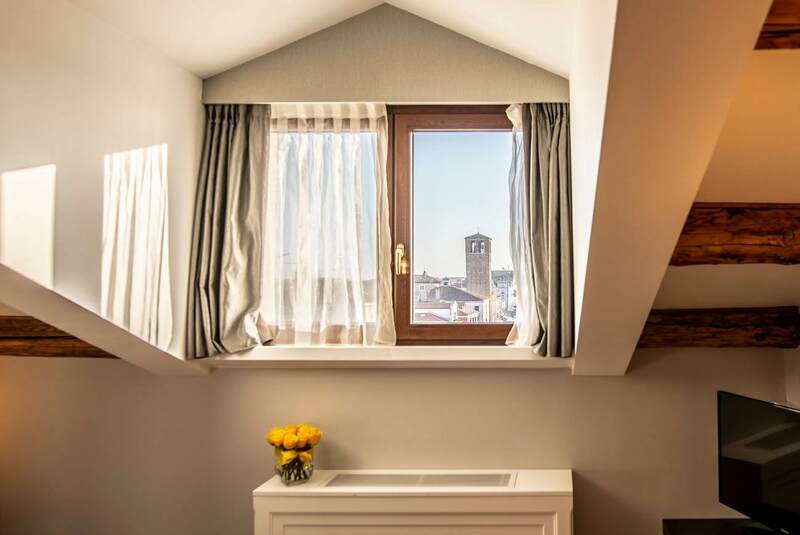 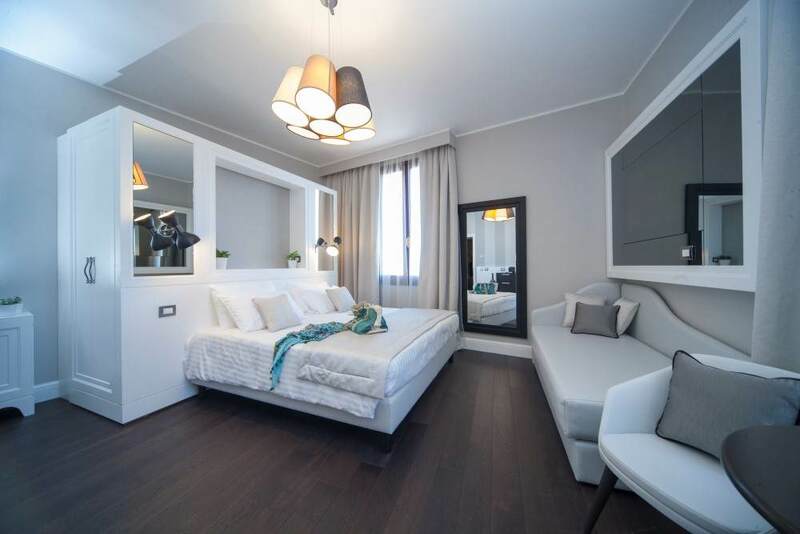 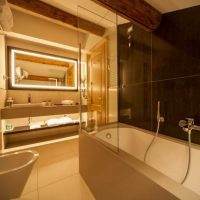 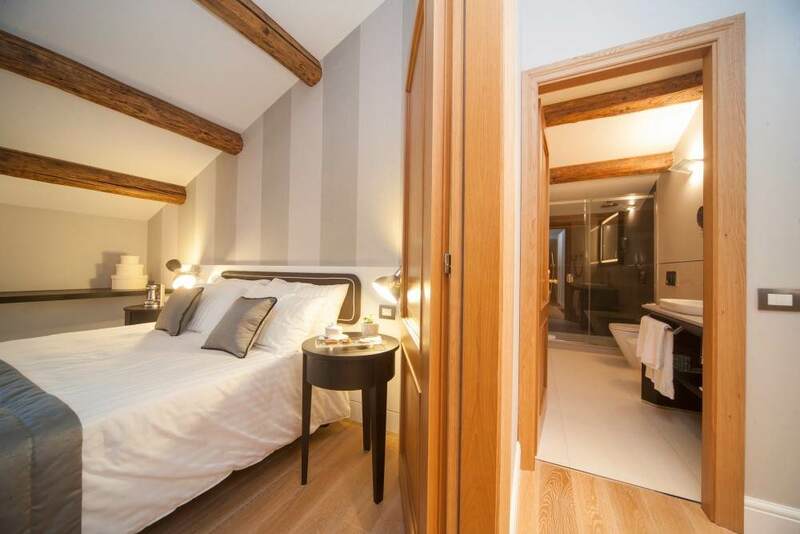 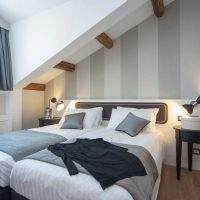 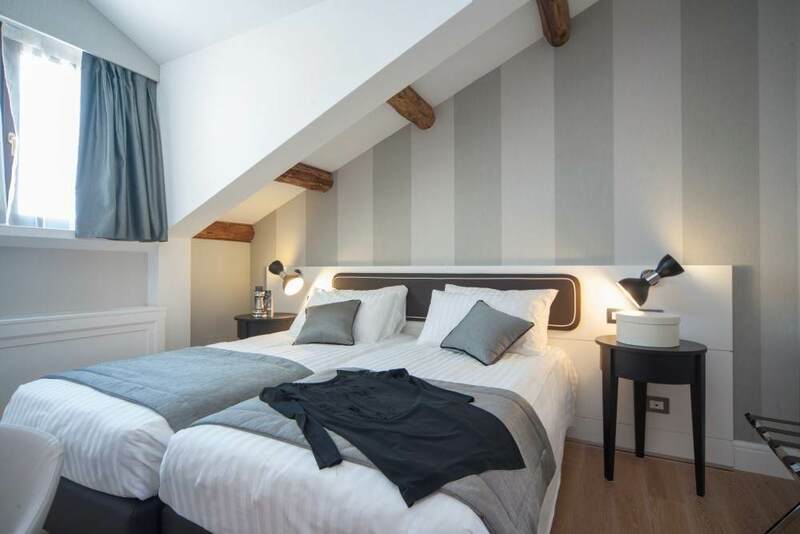 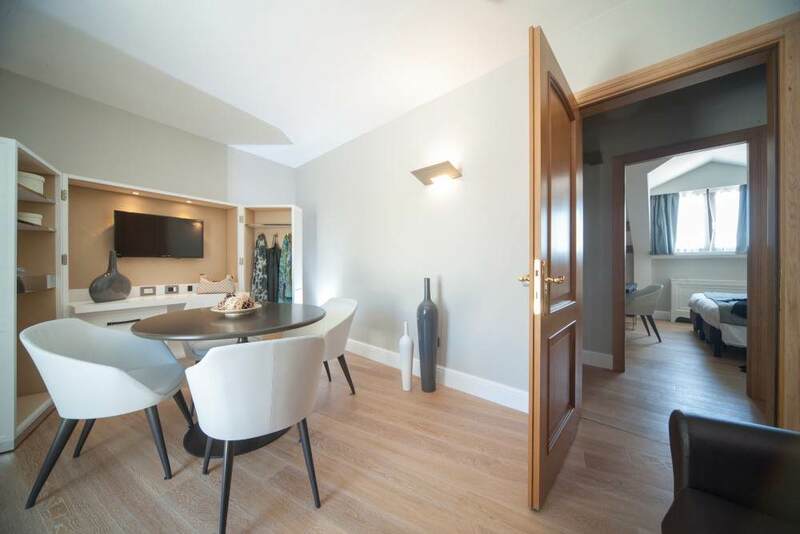 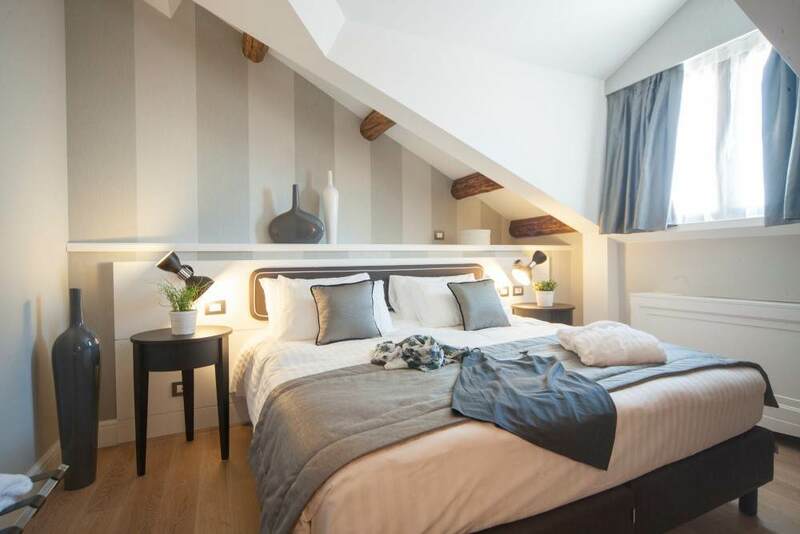 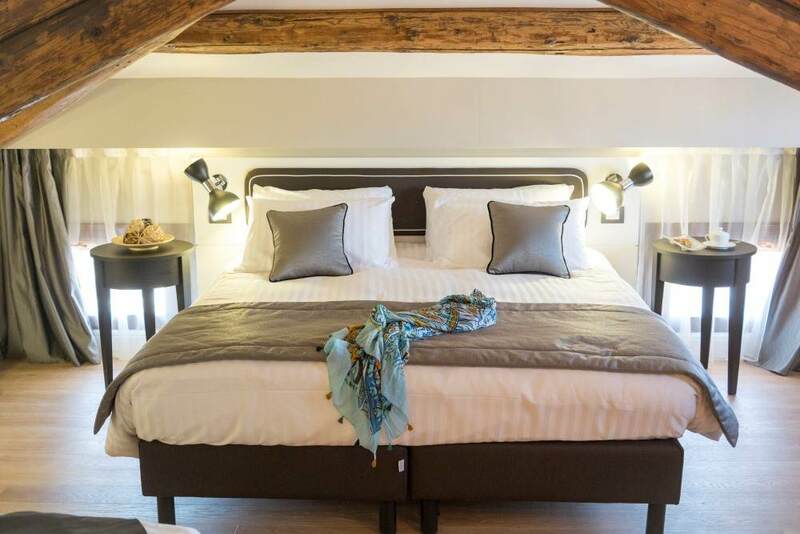 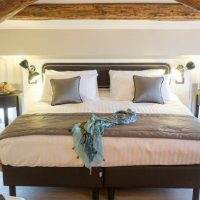 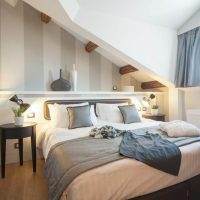 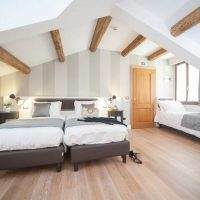 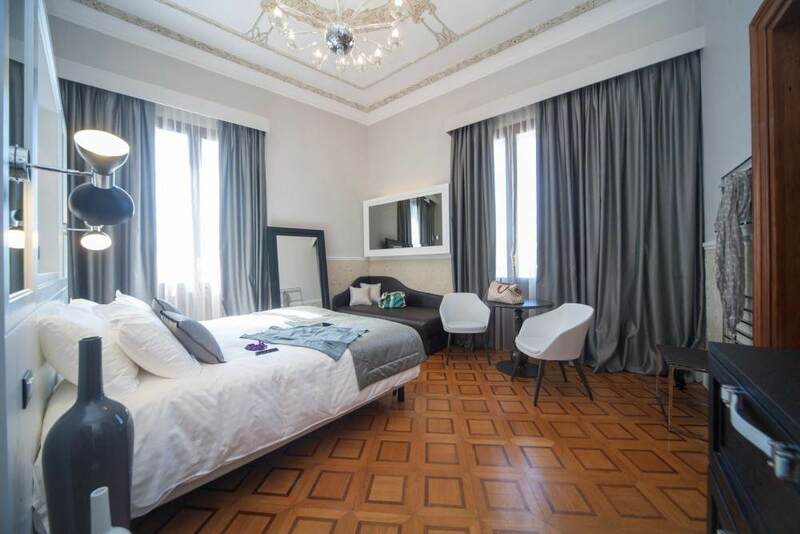 To complete the offer there are also particular attic rooms on the fourth floor, from where you can live with greater intensity the spectacle of the lagoon and you can enjoy an intimate and authentic setting. 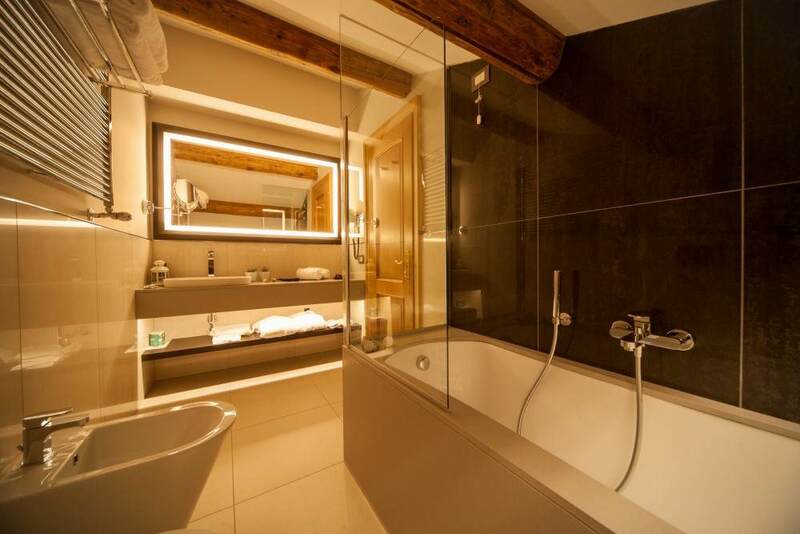 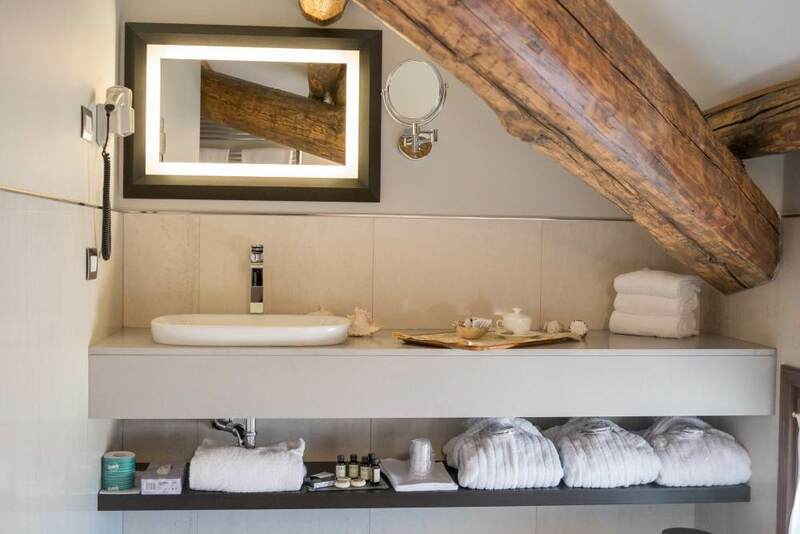 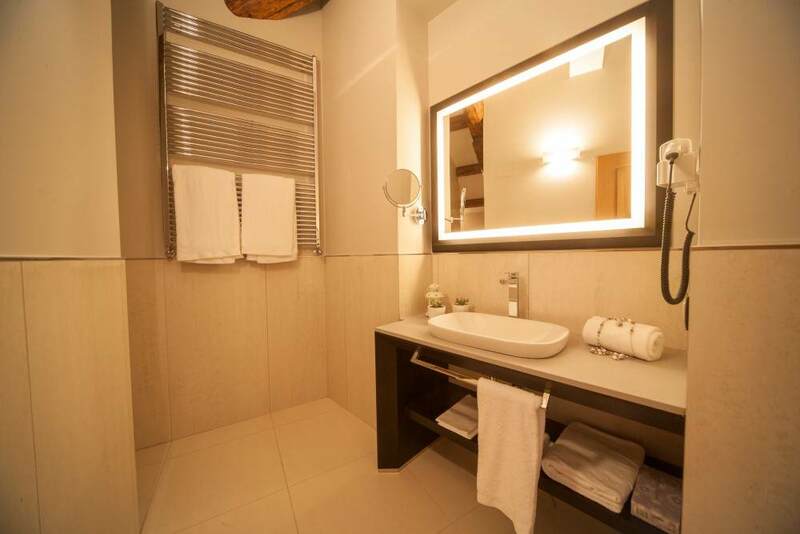 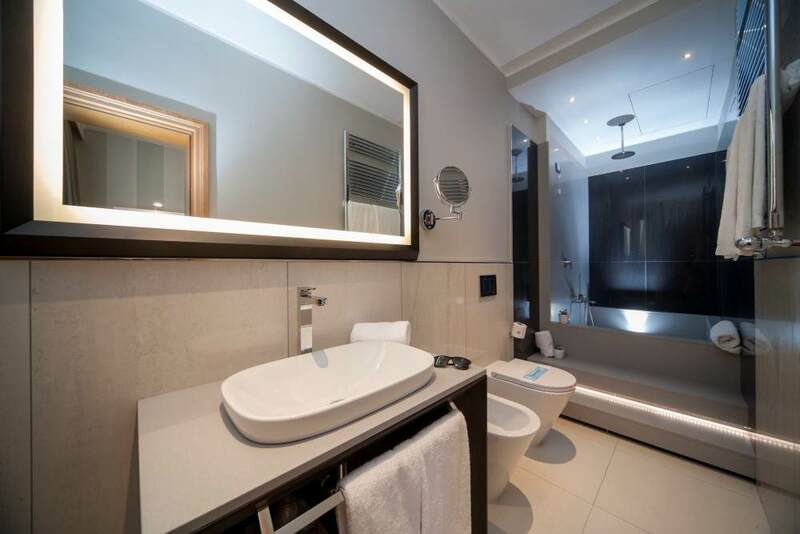 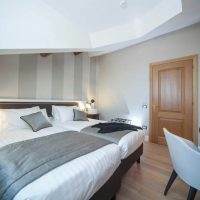 Elegant, spacious and harmonic rooms, equipped with all the comforts: Bathrobes, slippers and kettle with a selection of coffees and teas are at your disposal for the whole stay. 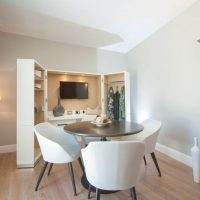 The Juniors Suites are ideal for a special and unforgettable stay, standing out for elegance, refinement and originality. 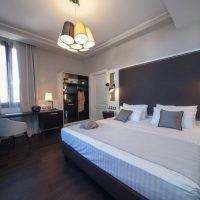 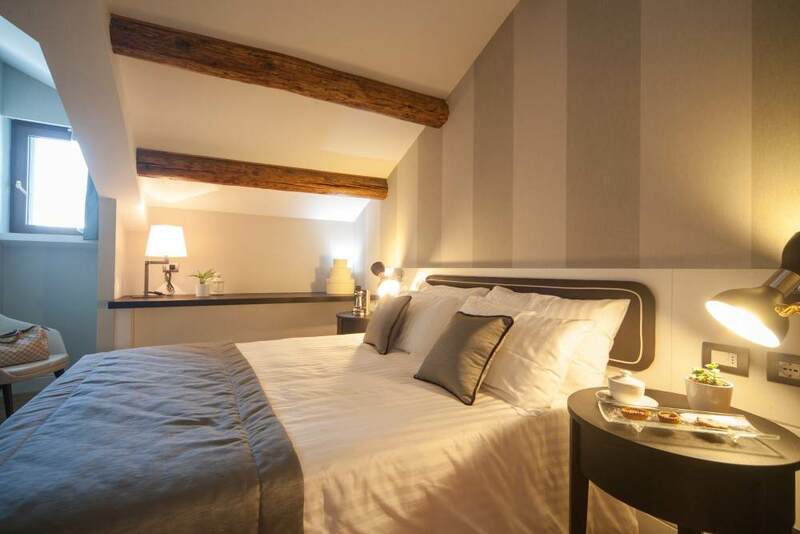 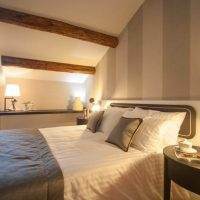 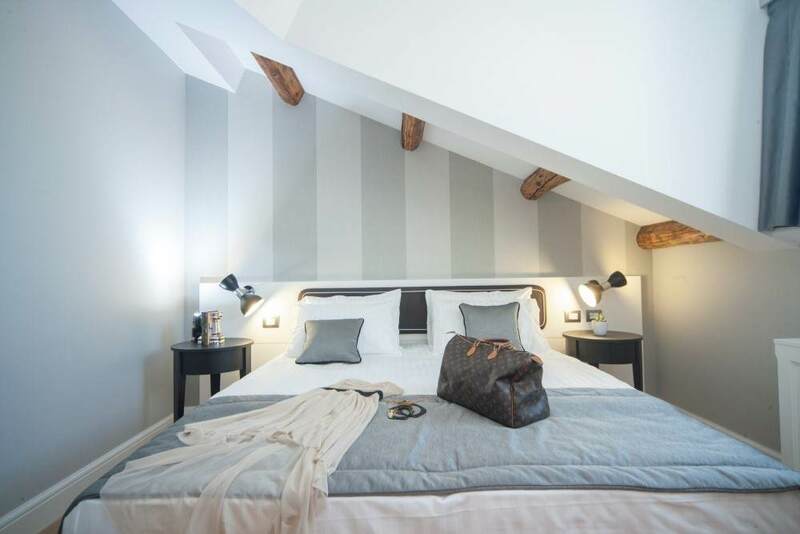 Room 406: Featured by a large double room and a cozy dormeuse in two separate spaces, Junior Suite 406 respects the guest’s privacy and relax. 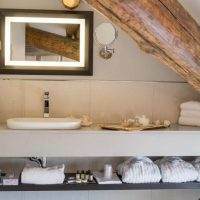 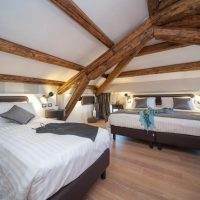 The ceiling with original wooden beams, highlighted by the top view of the roofs of the old town, gives an intimate and authentic atmosphere. 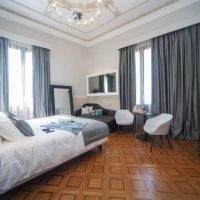 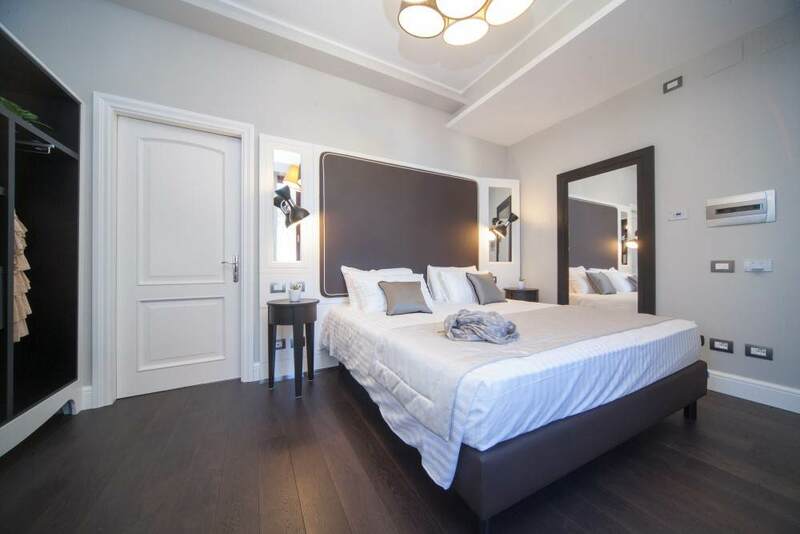 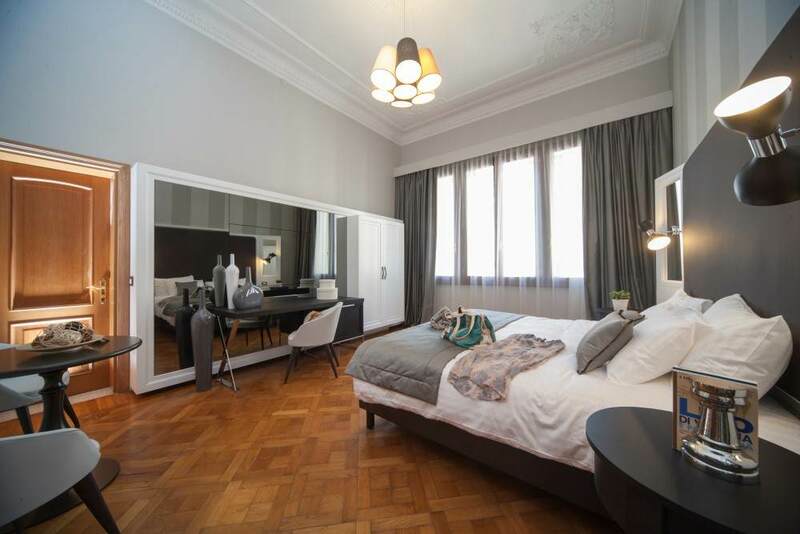 Room 409: Located at the top of the palace and furnished with elegance and attention to the detail, Junior Suite 409 offers authenticity, space and romanticism. 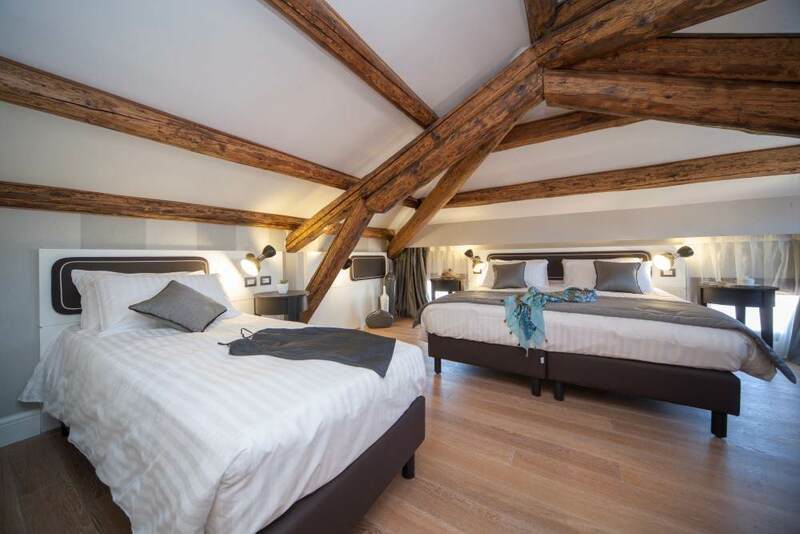 Its originality and the roof inclination enriched by exposed beams, create a very warm and exclusive setting, unique in its type. 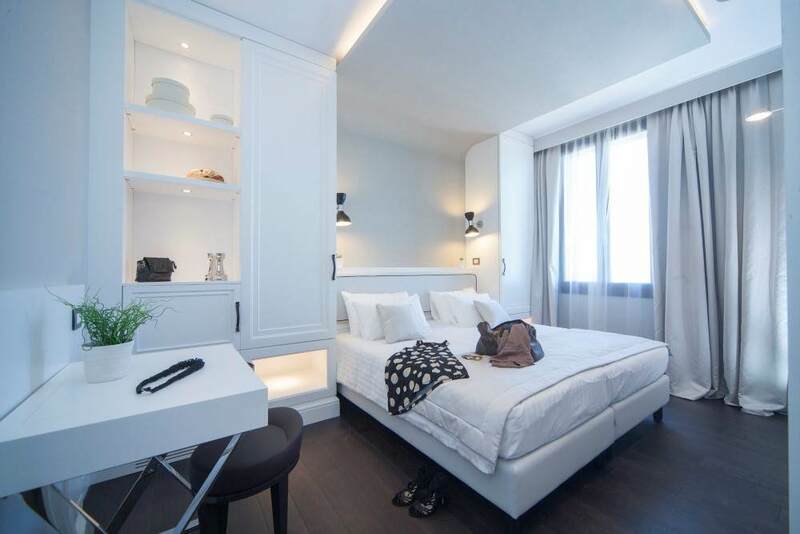 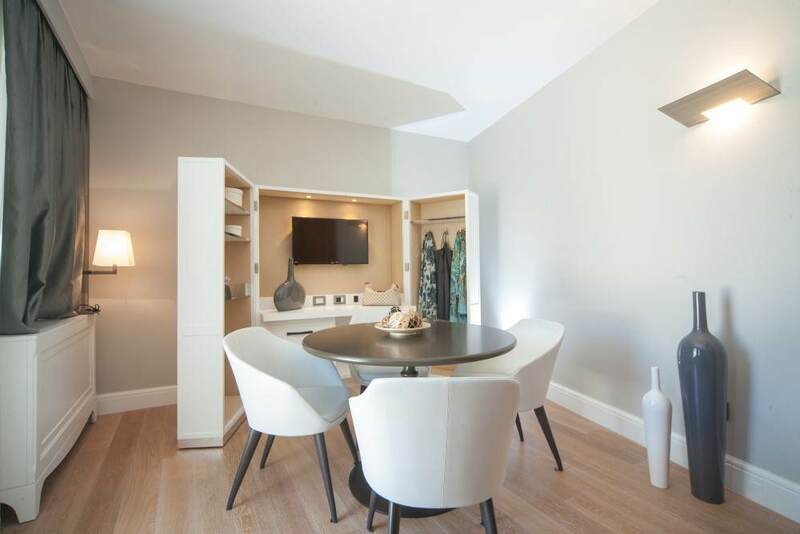 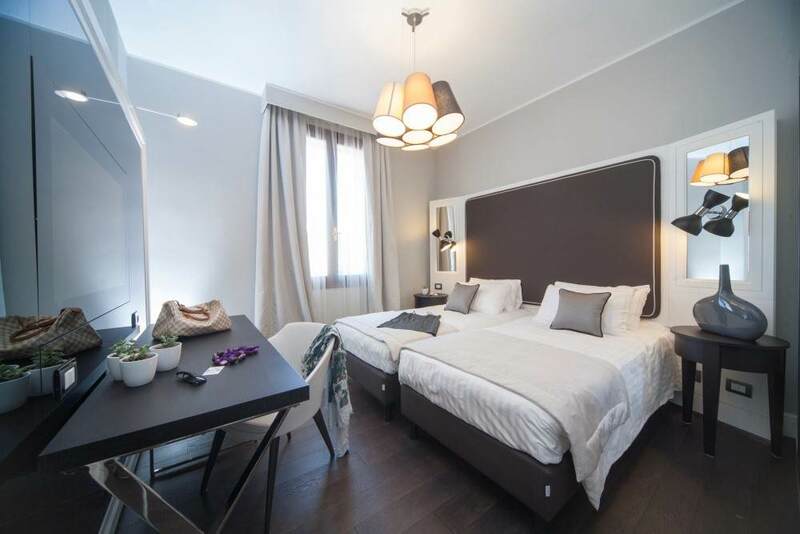 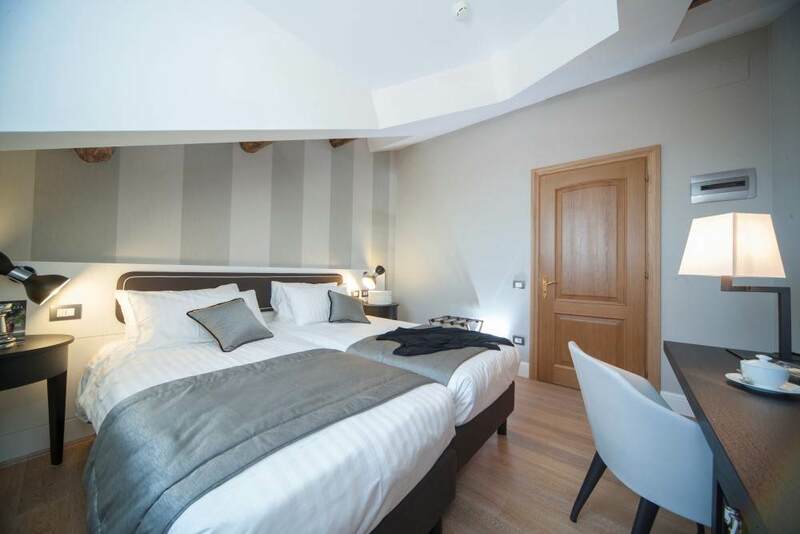 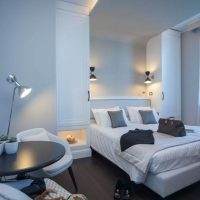 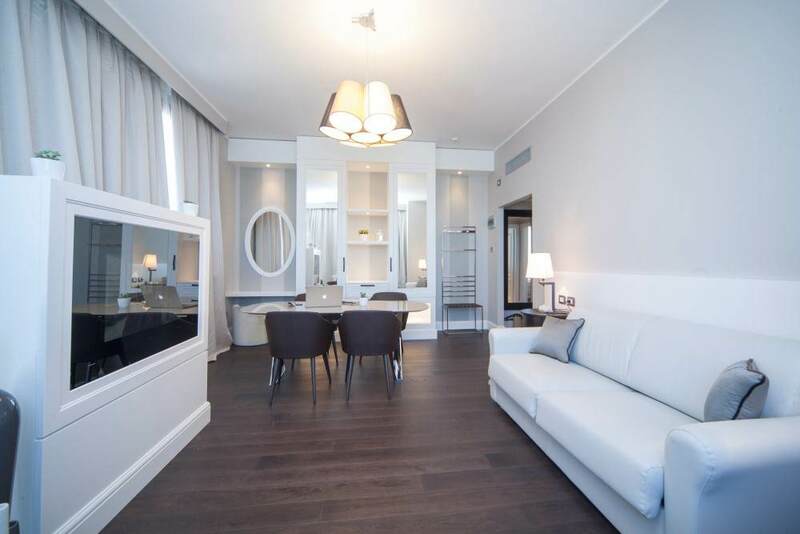 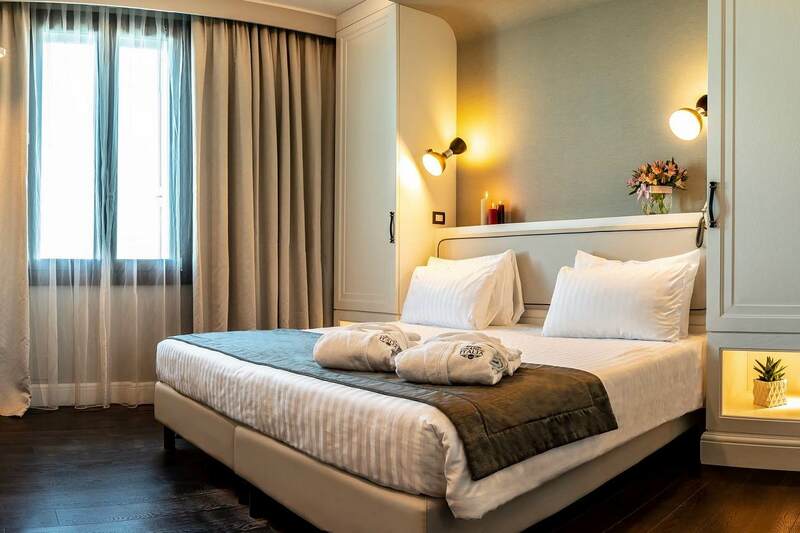 Directly facing on the fabulous Venetian lagoon and Piazza Vigo, our Suites are made of a large double room and a living room where you can find an openable sofa bed.